Big things have happened since I shared my second-time mom registry tips. And by big, I mean 5 pounds 13 ounces of perfection has joined our family. Kingsley Greer joined us on December 8, and in between bottles, we’ve been consulting on her nursery design. Thankfully, for the first few months, she’ll be sleeping next to our bed in her bassinet (a hand-me-down from her big sis and a registry must). As it turns out, we embarked on something slightly crazy during this already crazy time. We’re building a house! Nearing the finish line now, we’re counting the weeks until move-in day. As you can imagine, it’s been a long and sometimes stressful process, which is why I jumped on Pottery Barn Kids’ free design services. Designing a nursery can be daunting enough. Designing a nursery that’s not even dry-walled while balancing a toddler and newborn? Cue massive anxiety. 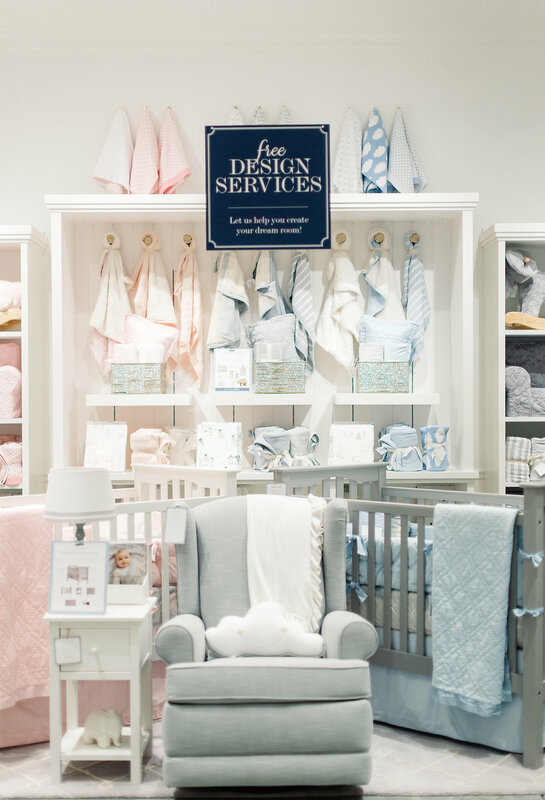 Since time is precious, I met with a PBK design consultant when I knocked out my registry, and we set right to work on creating the perfect space. First, to put things in perspective, here’s where we started. I snapped this picture three days before Kingsley was born. And here’s the little babe napping in her room a week later (talk about second child syndrome). Now let’s talk room design—because as you can see, we’ve got a lot of work to do! Without a doubt, I have a signature style, so much so that it became a challenge designing Kingsley’s nursery so soon after finishing her big sister’s baby room (I spy a Pottery Barn Kids crib, rocker and chandelier). Thankfully, my trusty PBK consultant helped steer me towards something that spoke my love language of pale pink and soft grays but gave Kingsley a unique space of her own. With my support system in place, I stepped out of my comfort zone and dreamt up a space with a pinch of modern flare and a ton of personality. Things I’m most excited about? The “funky” elements—the chandelier, the rug and the neon sign—each one of these items has their own fun factor, yet they all complement each other beautifully and create a room with character. The wallpaper—this will be my first room with wallpaper. To be honest, I was a little nervous about this at first, but now I’m itching to see how it brings the minimalistic crib I’ve picked out to life. The layers and textures—my first daughter’s room is very clean and simple, and I absolutely adore it, but I’m looking forward to playing with wall décor and natural elements (like a fiddle fig tree) to tie this design together. I’ll be revealing the whole nursery soon so be sure to stay tuned! Hi, where is the round rug from? The one with flowers & a green edge. Hi Kayla, Meghan believes it’s Safavieh purchased from Wayfair. This rug is very similar but not quite exact. Good luck in your search! Hello! What is the color of paint used for the nursery? Hi Ashley, Meghan didn’t paint it herself, but she thinks it may be Agreeable Gray by Sherwin Williams. What is the name of the crib in the room with the round rug? Thanks! Hi Heather, It’s the Juliette crib from Pottery Barn Kids, but I don’t think it’s available anymore. You can get a similar look with this crib. Good luck in your search! I hope you’ll post your nursery to our gallery when you are finished. HI! I love the room with the round rug! Do you know the name of the wall color? Thank you! Hi Danielle, Meghan didn’t paint it herself, but she thinks it may be Agreeable Gray by Sherwin Williams. What crib bedding did you use in the first nursery picture? Hi Emily, It’s a white sheet and pink crib skirt from RH Baby & Child. Good luck with your nursery design! Love that circle rug! Where is that from? Where are the animal nursery prints from in the picture? Hi! I love the neutral room with the round rug. I know this was posted over a year ago but any idea where I can find a similar rug and also do you happen to know where the prints hanging on the wall and chandelier are from? Thanks so much! The nursery owner thinks the rug was made by Safavieh, but I do not have the product name. Keep in mind that the room was designed around three years ago, so some products may no longer be available. Good luck with your nursery!